This manmade lake in the city of Udaipur is a destination for both locals and travelers looking to escape the energy of busy city streets. Home to three small islands, including Nehru Park, the picturesque blue waters and majestic green mountains serve as a breathtaking backdrop to this quiet respite. Visitors can navigate the calm lake aboard tiny motorboats, which carry travelers to the each of the small islands. Nehru remains the most popular, thanks to a well-kept garden, boat-shaped restaurant and a slightly lackluster zoo. The Udaipur Solar Observatory, ranked top solar observing site in all of Asia, is located on one of the lake’s other islands and draws tourists eager to check out the sky, the sun and the stars. 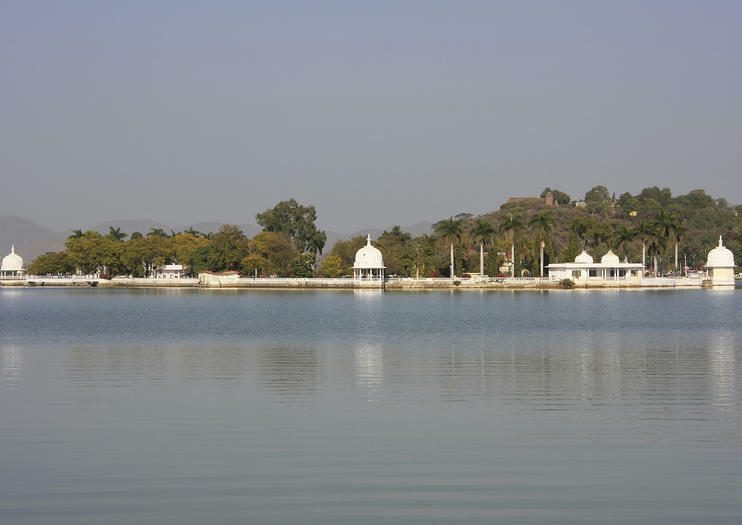 Fateh Sagar Lake is located in Rajasthan in the city of Udaipur, just north of Lake Pichola. It is easily accessible via public transportation, including local bus, rickshaw or taxi. Explore the top attractions of Rajasthan on a private 7-night tour that begins in Delhi and ends in Udaipur. You'll also travel through Agra, Jaipur, Pushkar, and Jodhpur, and visit important monuments including UNESCO World Heritage-listed sites such as the Red Fort and Jama Masjid in Delhi, the Taj Mahal and Agra Fort in Agra, and the Amber Fort and Fatehpur Sikri in Jaipur. Includes seven nights of accommodation in 3-star hotels, breakfasts, private vehicle and local guides, and hotel pickup and drop-off. People think there’s a culture of Rajasthan that has been there for a long time and then they witness it and become a part of it to enjoy and when they go back they cherish about this heavenly feeling. The major attractions of this tour are Mandawa, Sewaram Saraf Haveli, Hawa Mahal, Amber Fort, Brahma Temple, Pushkar Lake, Ajmer Sharrif Dargah, Lake Pichola and City Palace. By reading the further details of schedule it will be clear as for how amazing it is going to be on this Rajasthan Culture Tour with us. Private tour of India include the gate way of India Mumbai, Taj Mahal at Agra, Lack city Udaipur, Heritage pink city Jaipur and New Delhi the capital of India with trident hotel and domestic flight ticket. Get an in-depth introduction to picturesque, lakeside Udaipur—nicknamed the “Venice of the East”— during this multi-day guided tour. Highlights include a day trip to 7th-the century, UNESCO-listed Chittorgarh Fort (the one-time capital of Mewar), and a scenic boat cruise across Pichola Lake, plus a folk dance performance. To explore India’s Golden Triangle India Trip, which Includes must-visit sights such as the Amber Fort, Taj Mahal, with Visit to Lake city of Rajasthan..a Private Transportation expert needs with you on all Days. This Trip fulfills Your Transportation requirement. Udaipur – Elegant Palaces & Havelis ,the tale of Royal families. Explore the wonderful carved structure of Lord Vishnu as Jagannath. Visit of oranamental garden – the saheliyon- ki –Bari or Garden of Maids. A reason to visit the private folk-art-museum. Cruise the shimmering city at Lake Pichola. Intricate collection of dresses, jewellery, dolls, musical instruments. Travelling is a best way to overcome from hectic schedule. With the help of professional tour guide it becomes easy to move here and there. These guides have proper description of tourist places. And according to safety point of view also these guides are quite preferable.The Golden Triangle Tour lets you explore Delhi, Agra, Jaipur and Udaipur too. All these places are famous for their historical as well as architectural data. Talking about individual city every monument has its own story. Under this trip you will visit Qutb Minar, Agra and Fatehpur Sikri and many other monuments ion these cities. In Jaipur you can visit the Hawa MAhal, Jal Mahal, Jagdish Temple, Saheliyon ki Bari Garden, Fateh Sagar Lake and Bagore ki Haveli will be covered in this trip. Royal Rajasthan with Taj Mahal Tour is the finest introduction perfect for those who want to get drenched in the varied hues of Indian culture. This tour covers 8 eminent places positioned in the heartland of the country, i.e. Delhi, Agra, Jaipur, Udaipur, Jodhpur, Jaisalmer, Bikaner and Mandawa . The earth is like a beautiful ball that needs proper care from man to exemplify its nature’s beauty for forever. The manmade chiseled sculptures are unique and archeologically splendid. This tour is organized in such a way that it will take you to all the major attractions and fun places for your pleasure. The tour plan includes visit to Jain Temples, City Palace, Hawa Mahal, Amber Fort, Ranthambore National Park, Buland Darwaza, Jodha Bai’s Palace, Taj Mahal and Red Fort. You can go on reading about this tour below as it will fulfill a visit to all your dreamt places with joy and inner peace. Jaipur, the capital city of the most flamboyant state is the major tourist destination of the country. Beautiful forts, palaces and temples dominate the city and provide the visitors an enthralling travel experience. Jodhpur is an ideal place where you can experience the royalty of medieval India. The formidable Mehrangarh Fort, museums, palaces and splendid gardens all hint about the extravagant lifestyle of the erstwhile period.Udaipur, the beauty of the city has earned it the name 'Venice of the East'. The unending Aravali Hills, gleaming lakes, mesmerizing palaces and romantic hue defines the city of Udaipur. Always central to the region’s identity, Rajasthan’s flamboyance reaches its most arresting heights in the palaces and forts erected by the local Rajput maharajas. Bountiful trade and expedient military alliances with the Mughals paid for a building boom of lavish proportio.Rajasthan – literally ‘Land of Kings’ – conforms to a popular ideal of romantic India, boasting more maharajas’ palaces, camel treks and colourful festivals than you could experience in a lifetime.Itineraries tend to revolve around the state’s main cities, each of which is distinguished by a different hue: the salmon pink of the capital, Jaipur. Often referred to as the 'Venice of the East', Udaipur is undoubtedly the best place to holiday in Rajasthan. Adorned with pretty palaces and the scintillating lakes, Udaipur is located around azure water lakes and is hemmed in by lush green hills of Aravallis. The famous Lake Palace, located in the middle of Lake Pichola is one of the most beautiful sights of Udaipur. In this 3 days Udaipur tour, you will explore City Palace, Bagore Ki Haveli, Fateh Sagar Lake, Ambrai Ghat, Jagdish Temple, Udaipur Ropeway, Shilpgram, Vintage collection at Classic Car Museum, Eklingji and Nagda Temples and enjoy a boat ride at Lake Pichola. This 09-day tour includes visit to one of the most famous tourist circuits of India - Golden Triangle that includes popular cities of Delhi, Agra, Jaipur, and an extended tour to Udaipur - “The City of Lakes” of Rajasthan. Your tour starts in Delhi, India’s capital city, where you will enjoy riding on a cycle rickshaw through the historic streets of Old Delhi, also get henna tattoo done. In Agra, behold at the spectacular beauty of the iconic monument of love - Taj Mahal, Agra Fort, and take a trip to a marble factory to watch skilled craftsmen creating beautiful marble inlay and engraving art. Spend a day exploring the colourful and captivating city of Jaipur - the city of the Maharajas. Take a class on tying a Rajasthani style turban; explore the magnificent Amber Fort and other palaces. Soak up the sights of the mesmerizing Udaipur, including the impressive 18th century incredibly beautiful Bagore-ki-Haveli (a mansion) that will be your host to an entertaining music and dance show. Book this tour in Udaipur to visit some of the most popular attractions including City Palace, Jagdish Ji Temple, Bharatiya Lok Kala Mandal, Saheliyon-ki-Bari, Fatehsagar Lake, and Sajjan Niwas Garden. Kumbhalgarh Fort, a UNESCO World Heritage Site. Learn the history of the fort while enjoying its mesmerizing view. Also visit the Jain Temple in Ranakpur that took 65 years of careful construction for its complex structure. The lake and desert will become your landscape and will become your world for the tour. Every place arouse with a great history behind it. Some are peaceful while some violent. They left behind many secrets to be explored and there plays the role of tourist and travellers. It is a great combination of Golden Triangle Tour destinations with two more fantastic add-on such as Pushkar and Udaipur. They say that Past is dead but we don’t believe it. Our Past is always along the side of us,It is breathing, looking out and gearing up to lead us to the future and we call it Our Heritage. We, the Indians were invaded many times but our culture remained unaffected through ages. The enduring quality of Indian culture is the happy synthesis of worldliness and renunciation. Rajasthan the "land of Kings" is known for its hospitality, colorful culture, heritage and historical monuments across the world. The tourist destinations are Jodhpur famous for its desert Fort Mehrangarh reflecting various architectural styles, Jaipur reflecting the royal lifestyle of the past in its traditions and facades, Ranthambore, Udaipur housing gleaming lakes and mesmerizing palaces, Bikaner and Jaisalmer offers you best Camel Safari amidst the sand dunes , Pushkar a holy pilgrimage site where pilgrims across the globe come to remove their sins by taking a dip in the Pushkar Lake and many other cities.